Can you cruise with a disabled family member and still have a great trip? Absolutely!! In fact, cruising can be easier for a disabled person and their family than many other types of vacation. My daughter has Cerebral Palsy. For her, this diagnosis means she has wide spread special needs ranging from walking to eating and drinking. So, whenever we go anywhere with her, especially on vacation, we always do a fair amount of research to make sure she will be comfortable, have what she needs, and most of all, have fun. Of course, we want the rest of the family to have a wonderful experience as well, and cruising seems to have it all. The first thing we always do is make sure she has a wheel chair available to get around the ship, ports of call, and any shore excursions. She is not wheelchair bound, so she hasn't always had a wheelchair of her own. We were able to rent a wheelchair for her from www.specialneedsatsea.com. You can also check with your cruise access coordinator prior to your cruise to make arrangements for wheelchair rentals. When you rent a wheelchair, they leave it for you in your room so that it's waiting when you arrive. With the wheelchair, my daughter was able to get around the ship with ease. The thresholds can be a little tricky to get over sometimes, but for the most part, it was perfect. Of course, all ships have elevators, so changing decks wasn't a problem. The staff all over the ship were incredibly accommodating, whether it be by making room for her at a table in a restaurant or dining hall, holding a door for us as we pushed her wheelchair through, or just by smiling and interacting with her. No one ever seemed intimidated or inconvenienced by her disabilities. We were also able to take the wheelchair off the ship when we visited a port of call or went on an excursion. In fact, the staff is required to push the wheelchair on and off the ship, I think for liability reasons. That came in handy while the rest of us were preparing to disembark, etc. Since we were staying in a suite, our cabin worked well for her. We had two bathrooms. One had a large step up, so she just used the other one throughout our stay. Even if you are not staying in a suite, there are handicap accessible cabins available to book. We were able to find YouTube videos of our suite before booking it to make sure it would work for her. We also found video of the ship, so we were able to see how far our suite was from the elevators, whether we would be able to get around the ship with the wheelchair, etc. We were fortunate to stay in a Haven suite onboard the Norwegian Jade for our last cruise, which gave us access to the Haven Pool Deck. This was a huge help because my daughter wouldn't have been able to use the main pool or get around the main pool deck with ease, since there are so many people there most of the time. If you're not staying in a Haven suite, I would suggest using the main pool early in the morning or later in the evening to avoid the crowds. As I mentioned earlier, it's important to do some research ahead of time, especially when traveling with a disabled family member. A lot of the research we did was with regard to our ports of call and shore excursions. In addition to making sure our daughter's needs would be met, we wanted to be sure we would all have a lot of fun. Our first port of call on the Jade was Cozumel, Mexico. We had previously gone to a beach there, Nachi Cocum, that had worked well for us. So, this was an easy excursion to choose. When we disembarked in Cozumel, we found our own taxi. The taxi drivers were all very accommodating and put her wheelchair in the trunk each time without making it an issue. When we got to Nachi Cocum, the staff was very accommodating as well, making sure to make our path to the beach as wheelchair accessible as possible. Getting into the beach is not really designed for wheelchair travel, but there was a bit of a hardened path in the sand that made it easier to push the wheelchair. Once we made it to the actual beach, there were a few steps down she had to take. Fortunately, she is able to walk down steps with assistance. Again, the staff was right there to help out in any way they could. They gave us a location to sit for the day that was closer to the entrance/exit, so we wouldn't have to deal with taking her too far. Once she got into her lounge chair under the umbrella, she was set for the day. The waiter brought her food and drinks all day. The rest of us were able to relax and enjoy all the beach had to offer. The next day, we stopped in Costa Maya, Mexico and went to Maya Chan Beach. We had researched the different beaches to go to in Costa Maya, and found one that would work as well for us as Nachi Cocum. We had practically the same experience in Costa Maya as in Cozumel. We got our own taxi; the taxi driver was great; the staff helped us get our daughter to her seat without a problem, and we all had a wonderful day. It was absolutely beautiful there. There were lots of beach/water activities to do, and of course we loved just sitting on the beach and soaking up the sun. Our next port of call was Roatan, Honduras. We decided to do something other than going to the beach there. 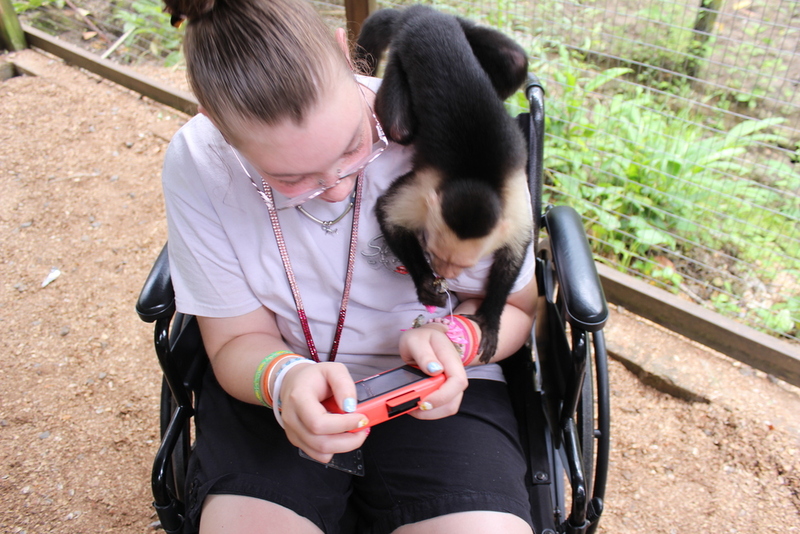 We had done some research on the different things you can do in Roatan, and chose one that met my daughter's special needs as well as being loads of fun for all of us. We booked a private tour around the island through Victor Bodden Tours. When we got off the ship in Honduras, we walked a ways (my daughter was in her rented wheelchair) to meet our private tour guide, Jo, and hopped in her van. The van was ours for the day, and there was plenty of room for all of us plus the wheelchair. The tour we booked allowed us to choose where we went and where we stopped to get out and shop, etc. Jo was great about suggesting places that would be fun for all of us, and yet, were handicap accessible. After we toured the island, we asked Jo to take us to Victor Bodden's Monkey Business, where we had a private tour through the animal zoo. We went into the monkey cages and played with the monkeys, pet the sloth, held the parakeets, etc, all of which were wheelchair accessible. In fact, the young man that brought us through the zoo pushed our daughter in her wheelchair. After visiting the animals, my son and I went zip-lining, while my husband and daughter watched from below. It really was a great day for all of us. Our last port of call on that cruise was to Harvest Caye, Belize, Norwegian's private island. Harvest Caye is brand new, so it's all handicap accessible. This was an awesome day in an amazing location. When we got off the ship, we walked a ways (my daughter in her wheelchair) to the private island visitors' booth. We had rented a villa for the day so, the staff in the visitors' booth made arrangements to have the wheelchair accessible golf cart come to transport us to our villa. We had never seen a wheelchair accessible golf cart before, but when it arrived to pick us up, the driver wheeled my daughter, chair and all, right up onto the cart and strapped the chair down. The rest of us settled into seats in front of, or behind, her. When we got to the villa, there were some steps for her to climb up, but again, the staff was very helpful. Once we got inside and were given a brief run down of the accommodations at the villa, we noticed that they had given us a sand wheelchair to use for the day. Again, the waiters and butler brought us any food or drinks that we asked for throughout the day. We all had everything we could ask for. When it was time to leave our island paradise, the wheelchair accessible golf cart brought us all the way back to the ship, where a staff member pushed our daughter's chair back onto the ship. With a little research and planning before hand, it is definitely possible to cruise with a disabled person and have an amazing time. Due to the nature of my daughter's disabilities, she wouldn't have been able to travel to each of these places, if not through a cruise. It's a much bigger ordeal getting her through security at an airport than it is to get her on a ship. At a time when airlines seem to be getting less and less accommodating, it has become much more difficult to travel with a disabled family member... unless you take a cruise! !